Understand how a credit card on file program differs from traditional payment options offered by practices. 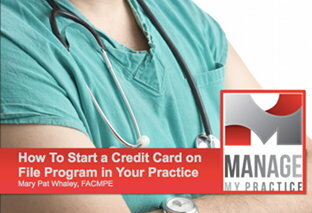 Be able to assess the benefits of a credit card on file program for a practice. Learn the terminology and protocols of credit card processing. Compare credit card processing fees and choose a vendor based on an informed analysis. Utilize provided handouts to train staff and educate patients on the credit card on file program. Successfully implement a credit card on file program.